Life in China began on an ‘uneventful’ note for Super Eagles striker, Brown Ideye on Friday as he fired blanks in his debut. He plays for Tianjin Teda. The Nigerian striker, who made his big money switch from Greece to China was in action for 90 minutes. Ideye tried to break through the defense but Tianjin Teda played out a goalless draw with Jiangsu Suning FC on Match Day two in the Chinese Super league. 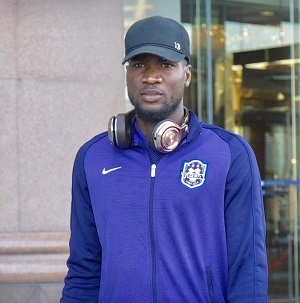 With Ideye firing blanks on Friday despite getting ninety minutes of action, the honour of being the first Nigerian to score this season in China may have eluded him. The three other Nigerian strikers, Odion Ighalo, Anthony Ujah and Obafemi Martins will have their chances to open the Nigerian Goal Account when their respective clubs over the weekend. Meanwhile, Ideye picked up his first booking in Chinese football on Friday as he was yellow-carded in the 28th minute. With the solitary point earned on Friday, Tianjin Teda provisionally occupy the eleventh position on the 16-team table in the CSL.